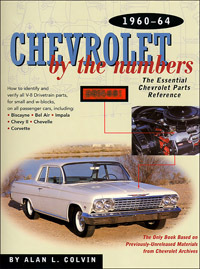 Chevrolet by the Numbers is the authoritative reference for identifying and verifying the correct Chevrolet parts, by casting number, for your exact model. Restoring your Chevrolet to original factory specifications? You'll find the casting numbers that correspond to your car's Vehicle Identification Number. With this correct information you will avoid buying - and being sold - the wrong parts. Buying a Chevrolet that has been restored? These numbers will help you determine whether or not the car has been authentically restored, and whether it's a smart investment. Searching for factory high-performance parts at swap meets? "Chevrolet by the Numbers" tells you which parts to look for, why they are special, and which engines those parts came with. Other books rely on secondhand information or out-of-date part numbers. Author Alan Colvin documented casting numbers for Chevrolet V-8 engine and drivetrain parts from 1955 through 1975, using original source material in Chevrolet's archives, including engineering blueprints, technical service bulletins, and build sheets. He interviewed the original manufacturers and engineers and brings you fascinating stories of parts development from behind the factory gates. Most of this information has never before been seen in public. If you absolutely want to know the original parts for your Chevrolet - not what interchanges or fits, but the correct part that came with your car when it was assembled - Chevrolet by the Numbers has the answer. Are you having trouble identifying a part on your car? Is there a part on your car that you believe is original, but its casting number is not listed in this book? Are there codes that you don't understand? Are you interested in the national trim validation service mentioned in Chapter 1? If so, print the PDF of our reader response form, fill it out, noting where your question or comment is, and mail or fax it to the author at the address listed. Help make this book the best reference it can be.